Left handed? Ukuleles aren’t out of reach. True, it is possible to restring a right-handed uke for left-handed playing, or even teach yourself to play a right-handed ukulele by learning the chords upside down. It’s far easier, though, to choose a ukulele that has been specifically designed to accommodate left-handed players. Our Top choice is the Oscar Schmidt OU2LH Ukulele. It’s a great choice for both beginners and intermediate players. When you take this approach, you’ll find it is fast and easy to learn chords and songs, particularly if you’re taking advantage of online videos. Unless you’re watching another left-handed ukulele player when you view tutorials, the player on the screen will be providing a mirror image of your own playing, making it easier for you to follow. Good for the beach, camping, etc. Constructed with beautiful mahogany top, back, and sides, the Oscar Schmidt OU2LH left-handed concert ukulele features a contrasting rosewood bridge and sealed chrome tuners. White binding adds additional contrast, providing a look that is well-balanced and wonderfully classic. Though simply adorned, this left-handed ukulele offers a sweet, mellow sound that makes playing a pleasure. Provided strings aren’t the best. After-market strings improve the instrument. Wonderful sound for such an inexpensive instrument. I am having a lot of fun with this uke – it’s also nice to have an instrument that is designed right out of the box for left-handed users. This model is a great one for beginners. The action and playability on this uke are fantastic. It is very easy to strum or fingerpick. Perfect for a beginner or anyone who would really like a very easy action. This uke is not loud but the sound is sweet and clear. I have a tenor but use this concert uke just as much, especially when I’m learning a new song. Who will Appreciate this Ukulele? If you’re a left-handed player with a budget around $100, and you like the idea of a concert ukulele, then you’ll probably like the Oscar Schmidet OU2LH. The right-handed version is among the most popular concert ukuleles on the market, and both right- and left- handed versions get high marks for their quality craftsmanship, durability, and full, rich sound. Among just a few beginner-friendly acoustic-electric left handed ukuleles, the Caramel CC100L offers many appealing features. Made with beautiful zebra wood with a lovely, natural finish, it features a leaf and vine motif around the sound hole. With contrasting rosewood bridge and fretboard, this ukulele includes a real buffalo bone nut and saddle and Aquila strings. A truss rod is embedded in its neck, allowing for adjustment as needed, and onboard electronics allow for amplified play when desired. This is a nice looking uke that holds its tuning well. The built-in tuner is a nice touch, and the build quality is good. 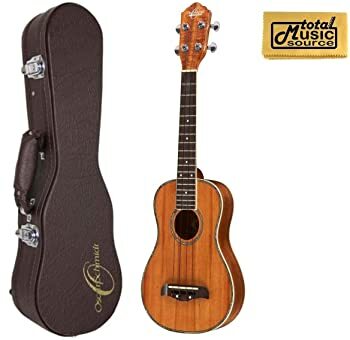 Overall, this is a fun uke to play and the price is great. This is a sweet sounding ukulele, particularly when played in acoustic mode. If you’re looking for a left-handed acoustic electric concert ukulele and you’ve got a tight budget to work with, then you’re likely to appreciate this one from Caramel. While its components are not high-end, it will allow you to experiment and give you a feel for the ukulele without requiring much of an investment. A stunning instrument designed specifically for left-handed players, the Luna Mahogany Tattoo Concert Ukulele LEFTY offers a number of exciting features. With a mahogany top, back, and sides, it features a laser-etched tattoo design inspired by traditional Hawaiian body art. Stylized “shark tooth” fret markers add even more character. The bridge and fretboard are made of rosewood, complementing the instrument’s overall appearance. 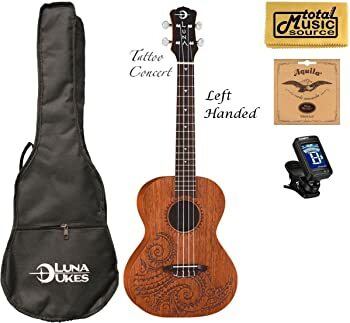 This left-handed ukulele package includes a gig bag, a tuner, and an extra set of Aquila strings. This is a really nice setup, with all the equipment needed to start playing. It sounds beautiful, too. My daughter loves this ukulele! She is in college and travels a lot with the church youth. She has enjoyed playing it and says it’s very easy to tune. Left-handed players who want a full bundle and a distinctive-looking ukulele are likely to appreciate this Luna Tattoo. It’s a beautiful instrument and the extras are nice to have. Both right- and left-handed Luna ukuleles receive top marks for their quality. If you’re looking for a good left-handed ukulele that will take you from beginner to intermediate and beyond, then you’ll find that this is an instrument worth considering. Offering the sweet, plinky sound traditionally associated with the soprano ukulele, this Mahalo Kahiko Plus Series is designed with the needs of left-handed players in mind. Available in your choice of transparent black or purple finishes, it comes with Aquila strings and a carrying bag. Great for the price. Easy to learn with a book and a tuner, and good for anyone who has an interest in learning to play without a big outlay of money. I’m a beginner and this ukulele has been good for me. The solid black finish is attractive and simple. The uke is small enough to fit in my backpack for trips, and the simple cloth bag keeps the dust off. It’s brought me a lot of calm and satisfaction as I’ve played it. If you’re looking for a beginner’s left-handed ukulele under $50, or if you’re looking for a cheap left-handed ukulele to take on outdoor adventures, then you may like this one from Mahalo. It’s one of just a handful of budget-friendly options available. Be sure to check restrictions for returning the ukulele if needed; some buyers report receiving right-handed ukes instead of left, and a few report flaws with the tuners. Bottom line? If price is your most important factor and you’re willing to take a risk, then you might want to take a look at this cheap left-handed ukulele. I love the OU5LH for its sweet, classic sound. It’s a pleasure to play. This is a great looking, beautiful sounding instrument that’s ideal for someone who knows they want to keep on playing the ukulele, and who wants something that’s built to last. The hard case really adds to the value. If your budget has some wiggle room and you’re looking for a combination of quality components and easy, pleasurable playing, then you’re likely to appreciate everything about the Left Hand Oscar Schmidt OU5LH concert ukulele. While it is not the cheapest ukulele available, it is well-built and will easily take you from beginner to expert. Looking for a good left-handed ukulele can be quite an undertaking, as there are not a lot of options out there. Take the following tips into consideration as you make your choice, and you’re more likely to be satisfied with your purchase. Materials and Components: When it comes to ukuleles, materials and components matter. Laminated woods are just fine, particularly for beginners. Nice tuners from a brand such as Grover will prevent the frustration that comes with frequent tuning, and good quality strings feel and sound better than cheap ones. Size: Choose a size that feels comfortable in your hands, and one with a sound that appeals to you. Price: Cost is a major consideration, but as with other things, you generally get what you pay for. Spending a little more means a better playing experience, a better sound, and an instrument that lasts longer. The good news is that the best beginner left-handed ukuleles aren’t terribly expensive, particularly when compared with larger instruments such as guitars. You can get a nice one for about $200, and sometimes less. The ukulele is a fun instrument to play, and it’s one that’s also very easy to learn. Once you’ve made your choice, expect to be hooked! We wish you luck as you embark on this wonderful musical adventure.